Songs We Love: Aloe Blacc, 'Merry Christmas Mr. Brown' The soul singer's musical gift to the families of police violence is a healing Christmas Spirit. Michael Brown. Eric Garner. Sandra Bland. Trayvon Martin. Freddie Gray. Oscar Grant. This is what Christmas sounds like in Aloe Blacc's "Merry Christmas Mr. Brown," the lone original song from his 15-minute Christmas EP, which was released via an unlisted YouTube link posted to his social media accounts on Black Friday. "'Tis the season for giving (from the heart, not the pocketbook) ‪#‎BlackoutBlackFriday," he wrote, all at once embracing the generosity that Christmas can engender, while supporting the political boycott of the most famous shopping day of the year. The YouTube-only EP also sidesteps the traditional route of donating proceeds to a cause — with no money exchanging hands, there are no funds to contribute. But there's still a lot to give. "Won't you please accept this gift/ Of Michael's memory from me?" asks Blacc of Michael Brown, Sr. The singer's baritone is plaintive as it works around intimate holiday details — placing ornaments on trees, impressions of smiles, evocations of memories — addressing those dealing with the wake of police violence and vigilante justice during the holiday season. Brown, Gwen Carr, Geneva Reed-Veal, Tatiana Grant, and the family and friends of Freddie Gray are addressed directly. There's power in those names and strength in the remembrance. Blacc makes sure that they are not forgotten in a rush of commercial gift exchanges and personal merriment. "New Year's Eve, Mr. Martin/ When you look up at the sky/ See the fireworks that sparkle bright/ Like the light in Trayvon's eyes." But while the song is full of hope for others, a bit of despair creeps in when Blacc looks around in Paris, where he recorded the collection: "Sitting on a train in Paris/ Where the streets are cold and bare/ And I wonder if it's gonna ever/ Feel like Christmas again out here." It's one of the more tender and sadder Christmas songs imaginable. It's also one of the most grateful and charitable. Necessary and honest, "Merry Christmas Mr. Brown" is what the season is all about. 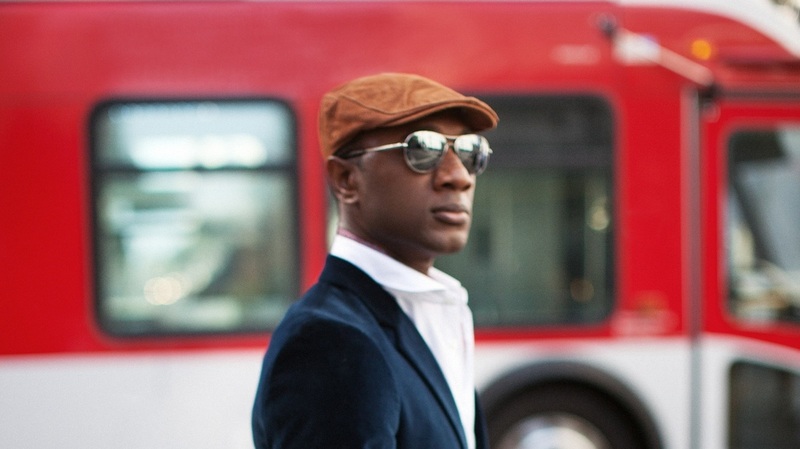 NPR Music talked to Aloe Blacc about the recording and the song. You recorded this in Paris. Was this before or after the recent terror attacks there? It was recorded about ten days after the terrorist attacks. Was it a response to what happened or was it something that you had planned already? I think the recording was definitely a response to what happened, but the song started during the holiday time of 2014 after Michael Brown was killed in August, and I was inspired and moved to write a memorial to the Brown family. But so many more deaths had occurred that I just felt compelled to expand the memorial to more families of victims of violence. Why did you use the families' and victims' names in the conversation? I chose the specific families because those were victims that were spoken about on television and in the media most widely, and I wanted to humanize the victims, to humanize the situation in such a way that didn't discuss the protests and it didn't discuss police brutality, but simply discussed the real human emotion around losing someone, so that everybody could connect through what these families are feeling. Have you had a chance to speak to anyone in the families? I had a chance during the 50th commemoration of Selma to meet the relatives of Michael Brown and Eric Garner. At that time I was not preparing this song, but I have had a chance to meet a couple of the families and express my condolences. Why did you make the choice to not advertise this widely or put it up for sale? It's not a product for sale — it's a memorial, a tribute. First of all, to me, it doesn't seem appropriate. It really was just an expression that I felt was important for me offer to these families, and for other people to hear so that they could have a voice for what they were feeling inside, because a lot of the dialogue that we hear in the media doesn't give us the opportunity to grieve a way that is respectful to the families. I wanted to offer that to everyone, especially the families. I wanted them to see that there are people who understand their pain and are not just trying to make a headline out of their tragedy. Aloe Blacc's Christmas Songs EP is out now on YouTube.